Please note that all winter talks begin at 7.15pm midweek, and at 2.00pm on Saturdays. The AGM will start at 7.00pm. All Talks, including the AGM are held in the Scarborough Lecture Theatre by courtesy of Durham University. 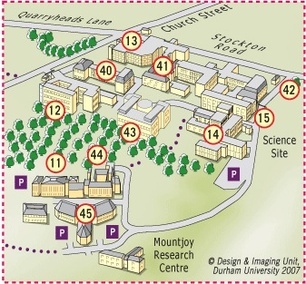 The Scarborough Lecture Theatre is located on the Durham University Science Site, which should be entered from the Stockton Road (at 42 as shown on the sketch). The entrance to the building housing the Scarborough Theatre is indicated by 15 on the sketch. Parking is further up the site road as shown. If you require level access to the Scarborough Theatre, please enter the building at the usual place, and turn right just past the security office, in the normal way. Instead of then turning left, and going down the stairs; go straight-on for 10 yards; then turn left. After about 20 feet, the lift is on the left, just before another set of stairs. Go down in the lift one floor, exit the lift and turn left, and left again. Walk 10 yards, and you will come to the bottom of the steps leading into the back of the Scarborough (the usual entrance in the refectory). But carry straight on, turn right, and then the lower entrance to the theatre is on the right. 'Weird and Wonderful' is a brief insight into the wide variety of stored collections at Beamish. Julian Harrop was born in Cheshire, moved to Middlesbrough in 1969, and then to Durham in 1991. He has worked at Beamish since 1989; initially on an Employment Training Scheme, then with the Education Officer, spending a season on site as a colliery engager. Julian then moved to working in the photographic archive, where he has spent 20 years. He is currently working as Collection Team Resources Co-ordinator, looking after the library, trade catalogues, periodicals, ephemera and photographic collections. ​Thursday 23 November 2017 at 7:15pm - Wayward Wynyard - Mr Ron Tempest. Ron Tempest will talk about the Wynyard Estate and a colourful version of the family history, with tales of turbulent Tempests, volatile Vanes and stormy Stewarts. Ron Tempest is a proud native of County Durham, and after his PhD followed a 35 year career in the global Pharmaceutical industry with a multi-national company, developing new antibiotics, cardio-vascular, diabetes and anti-haemophilia medicines, with postings in the UK, Germany, Japan, and the USA. He retired as a global VP. Post retirement, Ron Tempest returned north and took over responsibility for ramshackle historic family properties on the former Wynyard Estate; being taught farming by neighbours, and breeding a local endangered horse, the Cleveland Bay. ​ - Ms. Aerian Rogers. 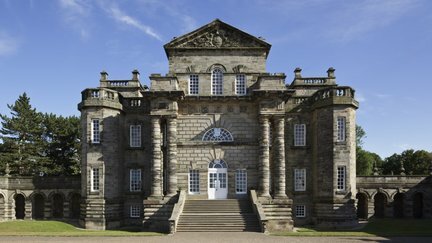 Aerian Rogers will be talking about the National Trust's planned £7.8 million conservation project at Seaton Delaval Hall. 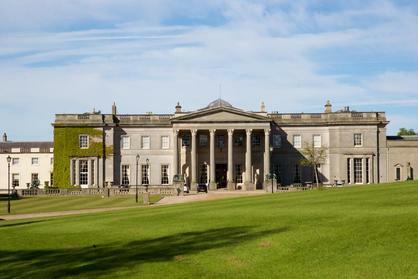 The project will restore the Hall and surrounding at-risk buildings, and will invest in much-needed visitor facilities. The project will most importantly bring to life Seaton Delaval's rich history by creating new interpretations about the famous, often infamous, Delaval family. Ms. Rogers hopes to be joined by Seaton Delaval's Project Manager or Curator. Aerian Rogers joined the National Trust 3 years ago as Fundraising Consultant for the North East. She previously worked for the Baltic Centre for Contemporary Art and the British Museum. She works with properties and donors across the region to enable vital conservation work. Richard Annis, Senior Archaeologist at Durham University, returns this year to give us a talk on the brewery which gave the world Newcastle Brown Ale. In 2005 the Tyne Brewery closed marking the end of 120 years of beer production in Newcastle. Richard will cover the industrial and social history of the brewery and excavations of the site following its demolition. Thursday 22 March 2018 at 7:00pm - AGM and Binchester, the Pompeii of Northern England? - New Light on Roman County Durham - Mr David Mason. ​David Mason, Principal Archaeologist at Durham County Council, will talk about exciting excavations at Binchester Roman Fort, which have taken place over several years as an international field school involving students from Durham and American Universities. The work has uncovered a cavalry barrack inside the fort and a bath building, which is one of the best-preserved Roman buildings in Britain.